With the looming retirement of America’s baby boom generation, the growth of spending needed to support the Medicare spending program is set to explode over the next 30 years. In its 2018 Long-Term Budget Outlook, the Congressional Budget Office projected the amount of net spending that Medicare is expected to consume from the U.S. government’s 2018 fiscal year through its 2048 fiscal year. 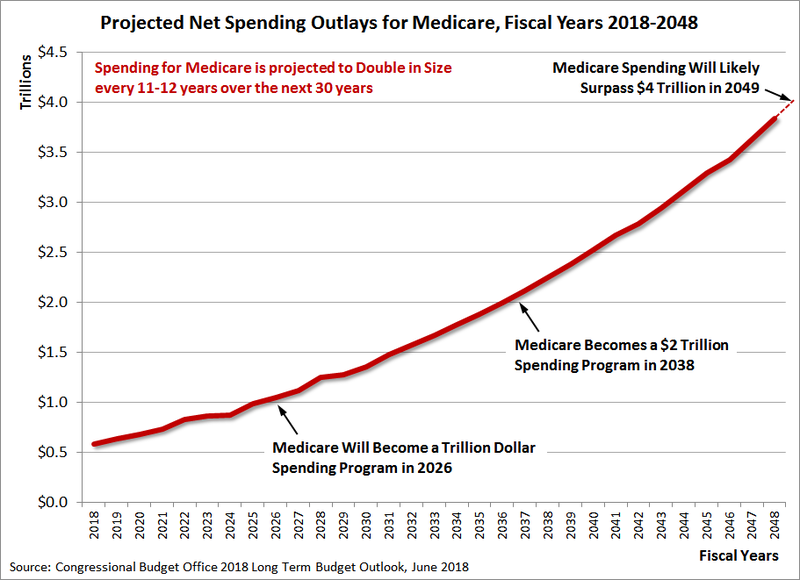 The following chart reveals that on its current trajectory, the cost of Medicare will double in size several times during the next 30 years. 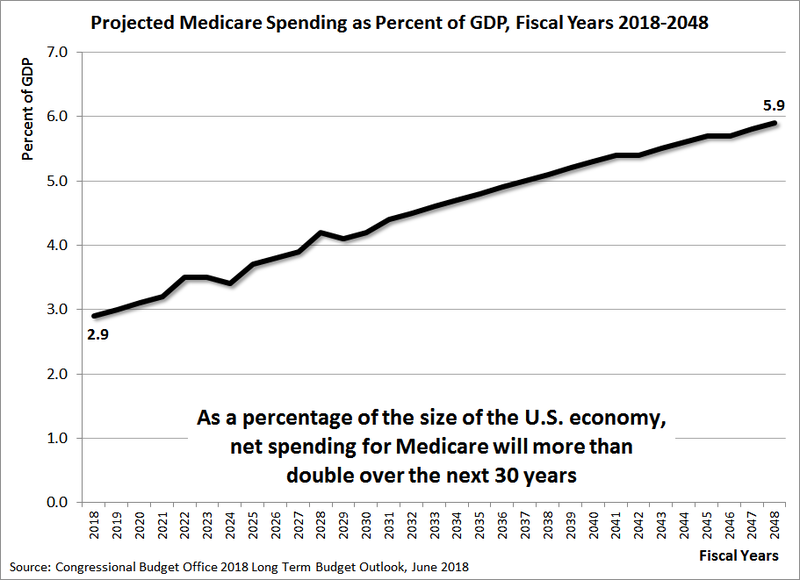 The U.S. government’s fiscal situation with rapidly rising Medicare costs does not improve much when measured against the size of the U.S. economy: Medicare spending will more than double from consuming 2.9% of the nation’s GDP in 2018 to 5.9% in 2048. How then could the Medicare program be reformed to provide for the needs of America’s senior citizens while also being put onto a more sustainable fiscal path? Writing at RealClearPolicy, James Capretta advocates a reform, suggested by recent research by Dartmouth College professor Andrew Samwick, that would set the premiums that senior citizens pay into their Medicare coverage based on their lifetime incomes rather than their current incomes. This reform could go a long way toward reducing the burden of rapidly rising Medicare spending on U.S. taxpayers. First, using lifetime earnings instead of current income wouldn’t penalize work. The current approach strongly incentivizes Medicare enrollees to lower their earned income when they reach age 65, or to retire altogether, in order to keep their total incomes below the thresholds established for income-related premiums. Samwick estimates that the current approach imposes an implicit tax of between 2.3 and 3.6 percent on all income above the initial threshold and below $500,000 for individuals ($1 million for couples). This implicit tax comes on top of the regular income and payroll taxes paid by these workers. That’s certainly enough of a disincentive to affect the behavior of some Medicare beneficiaries. Second, switching to lifetime earnings would also eliminate the penalty on savings associated with current law. Retirees depend heavily on withdrawals from retirement accounts and the realized gains from invested capital for their incomes. Imposing higher Medicare premiums based on realized income from these sources is equivalent to imposing a penalty on savings, which is both ill-advised as a policy matter and generally unfair. Using lifetime earnings as the basis for setting income-related premiums would allow workers to save as much as they wanted for their retirement without fear of losing some of it to a government-imposed income test. Third, switching from current income to lifetime earnings would make ability-to-pay determinations more stable and less easily manipulated. Retirees have significant discretion over the timing of their retirement account withdrawals and their sales of stocks and other investments to boost their incomes. Using current income provides an incentive for Medicare beneficiaries to minimize their Medicare premiums by consolidating all of their withdrawals into a limited number of years, and to invest in stocks that pay less in annual dividends. Using lifetime earnings would eliminate these distortions and allow retirees to deplete their capital without having to account for the effect of this income on their Medicare premiums. By linking the size of Medicare premiums to the beneficiary’s lifetime income rather than their current incomes, the federal government could potentially eliminate many of the perverse incentives that are contributing to Medicare’s excessive cost escalation under the current system. It could allow for better control over the growth of those costs while not impacting the quality of the system. It’s the kind of reform that ought to be seriously considered on Capitol Hill, but there are many questions that need to be answered before committing to such a reform. Hopefully, they’ll get asked sooner rather than later.